Great landscape design captures your attention and focuses it on special features within the newly defined space. It should complement or establish the style of your home. The view from your favorite room should draw you to the outdoors as an extension of your home. 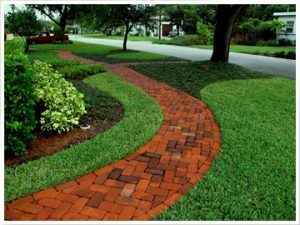 As your landscape design and landscape installation company, we know that carefully designed landscaping with personalized touches adds beauty and value to your home. Perhaps your home’s original plantings have become overgrown or your empty backyard is just waiting to be turned into your outdoor sanctuary. 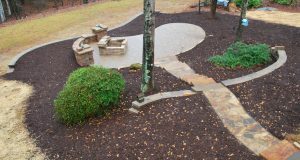 Our Landscape design and installation service area includes Fayetteville, Peachtree city and Newnan. We offer our services as far away as Luthersville or Griffin but we work in Fayette county and Coweta county most of the time. By keeping a smaller service area we can offer the best competitive pricing. We offer free onsite consultation as the first step. We listen to your ideas and help identify your personal taste. We identify problem areas that will need attention. We decide on locations for focal points, center pieces or “anchors”. We establish bed lines and turf areas to establish enough space for plant packages and hardscape features. We discuss time frame and budget. These steps are all necessary to begin a comprehensive landscape design or landscape plan. For more detailed examples or ideas of the above steps PLEASE visit Landscape design steps or visit our Landscape plans work sheet to get started, then contact us to set up your free onsite consultation. Our unique landscaping designs can create simple focal points, intimate getaways, or large outdoor living & entertaining areas along with plantings to complement them. The design details incorporated into a retaining wall or paver patio make your project its own work of art. For example, incorporate a planter box in a retaining wall or mix several colors into a paver patio to make it one of kind. 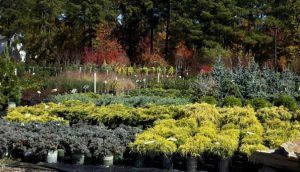 With the vast array of plant types and colors now available, it has never been more important to carefully select plants to insure low maintenance, and life long enjoyment of your outdoor living space. a good design chooses from. Outdoor rooms are created by using multi-textured patios, overhead structures, walls, and passages. Different materials for each of these elements are integrated into a flowing design to provide unique garden experiences. 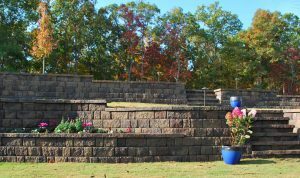 Garden walls can be plantings, wooden screening, hedges, or short retaining walls. Floors can be any type of paving, artificial turf or stone. Ceilings are created with awnings, arbors, or trellises. Incorporate a fire or the sound of running water to set the mood. A fire pit or water feature can complete the outdoor experience. Choose from bubbling earns or multi layered waterfalls. Create warmth and ambience with a fire place or fire pit. 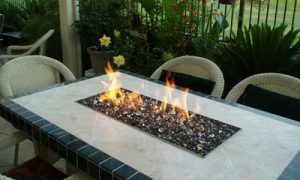 Gas fire pits or fire tables become gathering areas without the smoke of a campfire. All of these elements can be created from your favorite materials to meet your taste. 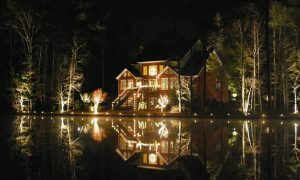 Lastly, set the scene with Landscape lighting to extend the views when the sun goes down & set the mood. 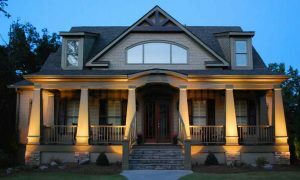 A well thought out lighting system creates a beautiful view from indoors, and allows enjoyment of your outdoor space after dark. The most economical approach to landscape design is a scaled sketch of the area showing all plants and hardscape items. Adjacent property lines and house walls are part of the drawing for reference. Using your wish list, we can provide a unique design for your needs and budget. At Landscape Innovations, we are dedicated to making your landscaping experience an exciting one. From concept to completion, every customer is important so we work hard to earn your trust and friendship. Daily on site supervision is our key to problem solving and great customer service. Trust Landscape Innovations to be your landscape contractor. Contact us now to get started.